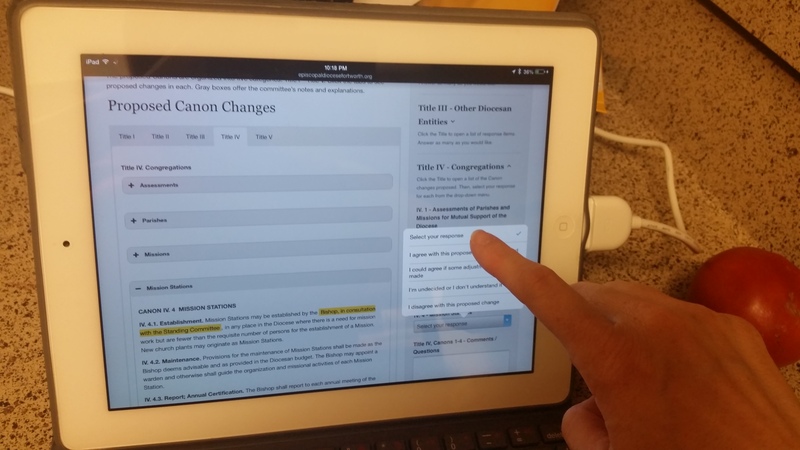 Download the final form of the 2014 Canons of the Episcopal Diocese of Fort Worth. There is also a redline copy available, showing the strikethroughs and additions that were made. Bylaws of Executive Council – PDF – approved September 13, 2014 The Executive Council of the Convention of the Episcopal Diocese of Fort Worth amended bylaws on September 13, 2014.. The Executive Council originally adopted bylaws on May 17, 2014. Code of Conduct for Meetings – PDF This Code of Conduct was adopted by the Executive Council of the Episcopal Diocese of Fort Worth on May 17, 2014, and is commended to all groups and gatherings of the diocese as a set of guidelines for our work together.